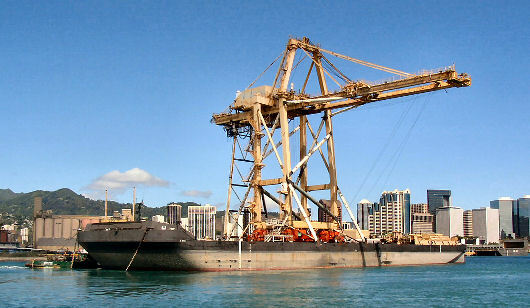 After the delivery of two Matson Paceco cranes to Sand Island in Hawaii in September 2002, the cargo barge Z BIG 1 was loaded with two container cranes that were sold to Schnitzer Steel Industries in Portland, OR. The first 865 ST heavy Mitsui crane with a rail gauge of only 32 ft was loaded over the side by rolling it on its own (turned) boogies over temporary rails. The second crane was sold as scrapped and lifted on the barge in small pieces. After loading, the crane and scrap pieces were secured to the barge deck, and the tow departed. Upon arrival of the tow in Portland, the crane was safely rolled off onto the high quay at high tide and the scrap lifted off. Photograph courtesy of Rigging International, Inc.
Simulation of the crane roll-on and roll-off operations and optimization of ballast procedures.